Why choose silver? 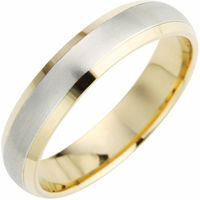 Silver is a popular choice for wedding rings because it polishes to a beautiful mirror finish. (It was even named for its shine: Its chemical symbol 'Ag' is from the Latin 'argentum', which is in turn is from the Ancient Greek word 'argentos' meaning 'white, shining'.) Another reason that silver is a favorite choice for jewelry is that it costs less than other metals - it is more abundant in nature and is easy to shape. However, silver is a soft metal that is easily scratched or tarnished, and wedding rings need to be able to withstand a lot. Silver can be affected by the acid present in the natural oils your skin produces. The acidity of skin varies from person to person. For this reason the way the ring ages depends a lot on the wearer. hence not ideal for making wedding rings"
History of silver: There is a lot of silver mined every year, which is why it can be used in many industries other than jewelry - including dentistry, photography, medicine, electrical manufacturing and even in nuclear reactors. Even though it is important in so many different ways, man has used silver for decoration for thousands of years due to it's unrivalled white metallic luster and malleable nature. There is evidence to suggest that man learned to separate silver from lead as far back as 3000 B.C. Before the 1800s, possession of silver was limited to the very wealthy, but technological and economical developments from this time has lead to silver being the popular - yet precious - commodity it is today. The price of silver has been quite volatile over the last century, and can depend on industrial demands as well as other factors. As with all our metals, the price at which we sell silver is updated each week to reflect the current market value.